Given the rise of electric vehicles, and the speed at which these cars are hurtling towards us, the need for greater cobalt supplies has become clear — it is a vital ingredient in the manufacture of rechargeable lithium-ion batteries which electric vehicles rely on. Today’s company has been exploring for gold and nickel in the prospective lands of WA, but it’s now broadened its focus, venturing into the cobalt-rich land of British Columbia (BC), Canada. Its newest asset — the Little Gem cobalt-gold project — covers 195 square kilometres and lies in a resource-rich and high-grade gold mining district. It is a mere 15 kilometres along strike from the Bralorne-Pioneer mining complex (4.4 million ounces at 17g/t gold) which is BC’s biggest gold producer, and the sixth largest in the country. Positive results have already been received from the first drill hole at its maiden drilling programme at the project and the company has now engaged a drill company and mobilised a rig to undertake further drilling. This seems to be an ideal location to be exploring for cobalt, with the region generating more and more attention as somewhat of a Cobalt Capital. That label is made all the more relevant by virtue of the fact that the country has ideal export access to China and the US. This company’s Little Gem project has been delivering some very high-grade results, with exploration efforts set to switch into overdrive as interest in Canadian cobalt takes off. 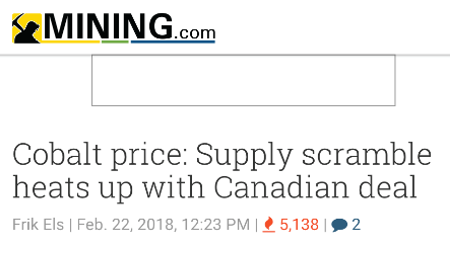 The company does not have cobalt in its name, as it was predominantly in gold before purchasing its latest Canadian cobalt project — which goes some way towards explaining why metals play is potentially under-valued at the moment, and flying right under the radar. That said, at least a few people seem to have cottoned on, as the A$36.56 million-capped play raised A$5 million last year to drill out the Little Gem target. It should be noted thought that this stock does remain an early stage play and investors should seek professional financial advice if considering the company for their portfolio. This one seems like a well-kept secret — so far. But that could all be set to change as it ramps up its exploration with a 6-hole drilling programme later this month. While Blackstone Minerals’ (ASX:BSX) primary focus now is its Little Gem cobalt-gold play, it still continues to work on its Silver Swan Gold Project in Kalgoorlie — and is still progressing two other Australian gold projects. 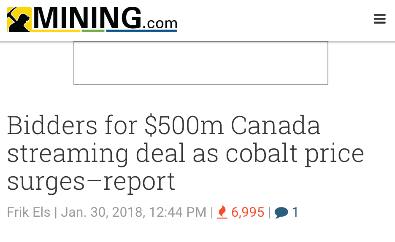 With so much interest and activity around its shares since its Little Gem purchase in August last year, it seems like a good time to hop on board what could be the next (lithium-ion battery-powered) runaway train... cobalt from Canada. 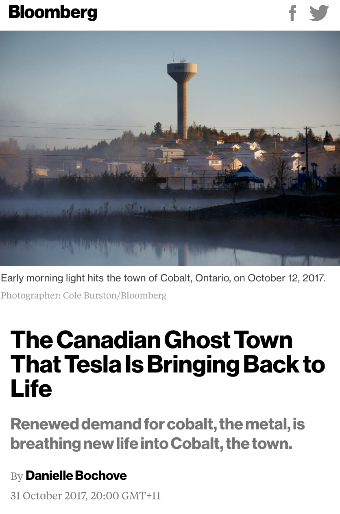 This location in Canada is generating some significant interest from both cobalt juniors as well as investors, as evidenced by the pick-up in newsflow detailing this latest cobalt hot spot. The Little Gem Project was first discovered in the 1930s by prospectors identifying a pink cobalt-bloom on weathered mineralisation that led to three adits being developed. Being that gold was the focus then, it meant that cobalt was effectively treated as waste ore (somewhat ironically given today’s context). In fact, the presence of high amounts of cobalt may have even resulted in the miners eventually leaving Little Gem, because the cobalt-rich metallurgy of the deposits could have posed a bigger challenge for filtering out gold. They didn’t have the kinds of modern-day mining capabilities we now have. However, they did manage 1,268 metres of drilling from underground, and conducted detailed channel sampling from the adits (which only reached 50 metres). 3.3m at 1.4% cobalt and 80 g/t gold. 1.3m at 4.0% cobalt and 29 g/t gold. 0.1m at 4.6% cobalt and 800g/t gold. The company has engaged Radius Drilling Corporation to begin rig mobilisation and commence drilling at the very high grade Little Gem. Radius Drilling is one of British Columbia’s premier diamond drilling contractors and specialists in drilling in winter conditions. BSX is planning an initial six diamond drillholes to test the original ~300 m strike target zone at Little Gem before looking to explore the +1.0 kilometres strike extension to the east and +500m strike extension to the west. BSX maiden drilling programme will now re-commence and follow up the following significant result from the first drillhole of 4.3m at 1.0% cobalt and 15g/t gold; including 1.1m at 3.0% cobalt and 44g/t gold. This next round of drilling will follow up on the company’s first drill hole and complete its maiden drilling programme. In January BSX announced the results from the first hole of the maiden drilling programme, which intersected massive, semi-massive and disseminated mineralisation. 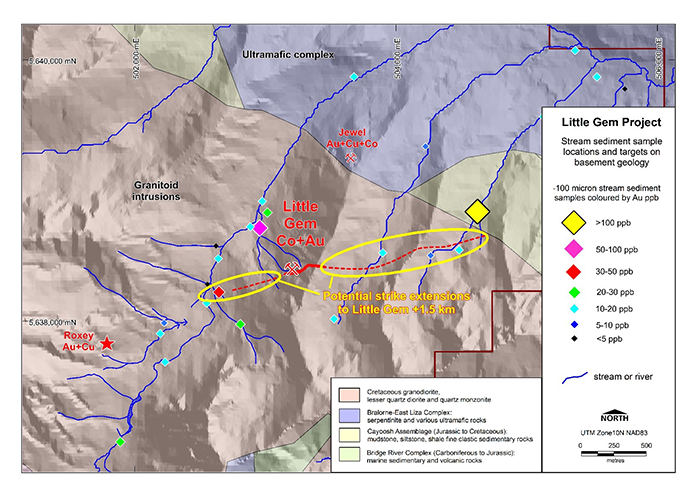 The most significant results were 4.3m at 1.0% cobalt and 15g/t gold; including 1.1m at 3.0% cobalt and 44g/t gold support the findings from the historic drilling undertaken at Little Gem which we just outlined. The first hole undertaken by BSX has only tested the upper portion of the mineralised target with multiple zones of massive sulfide (copper-gold) mineralisation identified within a broader alteration halo. So far, the maiden drilling is on track to prove up the exceptional historic underground drilling results... considering the Little Gem Project covers a large landholding, some 48 kilometres of untested strike potential, that’s big news. Bou-Azzer is a world class cobalt-nickel mine in Morocco, containing gold-silver arsenide deposits — and is currently one of the world’s only operating primary cobalt mines. The incredibly resource-rich district contains over 50 deposits, has been variously mined for over 75 years, and has produced over 100,000t of cobalt... plus 1000s of tons of silver and tens of tons of gold. The current production at Bou-Azzer is approximately 2Kt a year of cobalt, and an estimated head grade of 1.3% cobalt and up to ~3-4 g/t gold. The total current Resources and reserves are estimated at 17,800 tons of cobalt. BSX has a lot of work to do to match this, so investors should approach any investment decision in this stock with the appropriate degree of caution. The mineralisation at Bou-Azzer is concentrated mainly within quartz-carbonate veins along boundaries of neoproterozoic serpentinized mantle peridotites, quartz diorite and Precambrian volcanic rocks... in similar fashion to Little Gem. One of the camp’s 60 mineral localities is the aforementioned Bralorne-Pioneer mining complex. 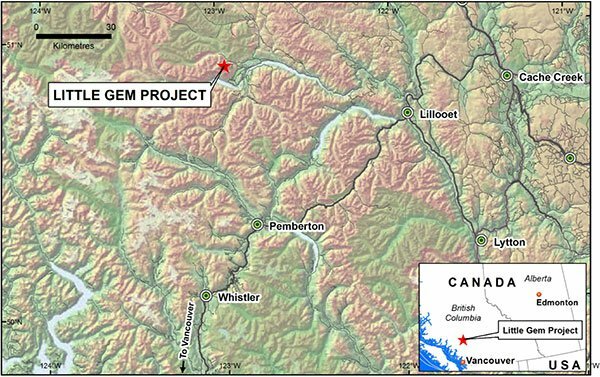 It has an endowment of 4.4Moz at 17g/t gold, and is the foremost gold producer in BC and the sixth largest in Canada. Little Gem is just a Little hop, skip and a jump from the Bralorne-Pioneer complex. Since BSX got its hands on Little Gem, it has not only verified the mineralisation identified historically at the site, but has also found a new high-grade gold prospect named Roxey. 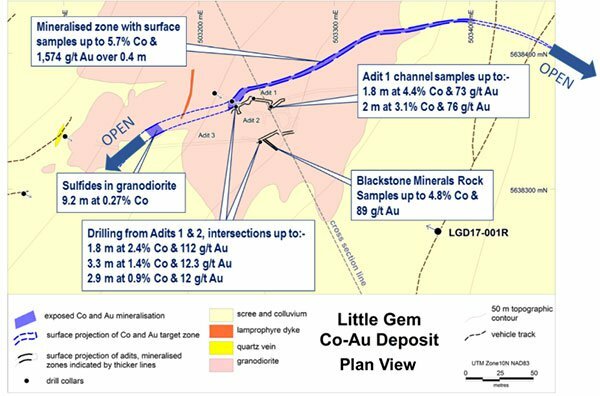 The Roxey Gold-Copper prospect is located 1.5 kilometres west-southwest, and along strike, of the Little Gem Cobalt-Gold gold mineralisation. BSX discovered Roxey during an initial site visit and took rock chip samples to see exactly what they’d found... results assayed up to 24g/t gold, 1.9% copper & 24g/t silver. As part of BSX’s project tenements, it has taken ownership of the historic Jewel gold-copper prospect (see the location of the Jewel Mine top-left in the image above). The Jewel gold prospect supported some gold production from 1938 to 1940, and is located only 1.1 kilometres north-northeast of the Little Gem Mine. 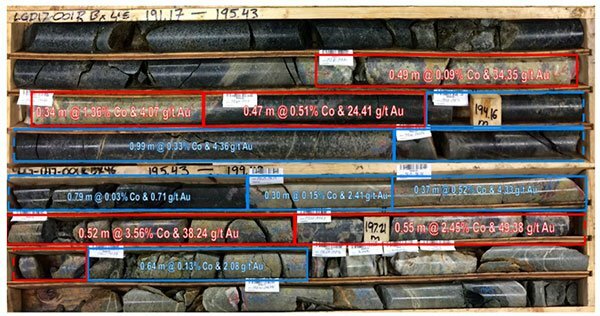 Surface rock chip samples intended to verify the mineralisation at Jewel returned up to 98g/t gold and 3.2% copper. Mineralisation at Jewel sits in an ultramafic near the easterly trending/steep south dipping contact with the quartz diorite/granodiorite that hosts the Little Gem Prospect. BSX plans to complete the maiden drill program upon recommencement in the second quarter of 2018, to follow up the outstanding initial results and to further understand the full potential of the Little Gem prospect... and importantly, deliver a maiden Resource in the medium-term. The first successful diamond drill hole tested the upper portion of the alteration zone, however, it was terminated due to mechanical issues halfway through the mineralised target. The results gleaned were still very promising, and the company is now getting back on track. It’s now in the process of liaising with contractors to get a fully functioning drill rig on site and operating as soon as practicable. 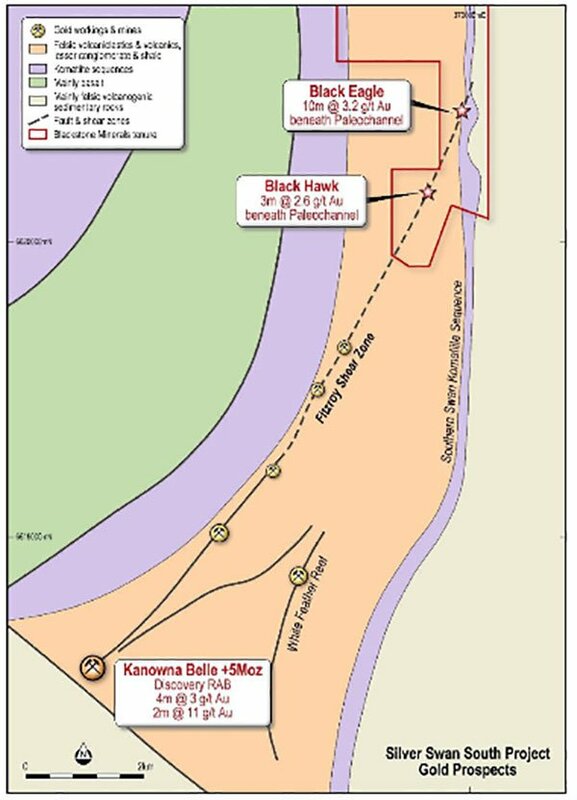 While admittedly now overshadowed by its shiny new cobalt catch, BSX continues to progress its Silver Swan South nickel-gold project located just eight kilometers along strike of the world class Kanowna Belle Gold Mine (+5Moz gold endowment) near Kalgoorlie, WA. The latest project news came earlier this month, when the company announced an emerging gold discovery with significant results from the second phase AC drilling program at Silver Swan South. Drilling has intersected gold mineralisation and extensive basement geochemical anomalism at the Black Eagle prospect with the following results: 10m at 3.2 g/t gold from 68m within, 15m at 2.2 g/t gold from 64m to EOH. This represents a significant upgrade to the Black Eagle prospect. Combine it with previous reconnaissance results of 3m at 3.5g/t gold from 60m and Black Eagle begins to look like a priority drill target at Silver Swan South. BSX intends to commence AC drilling in the near-term, with a particular focus on the Black Hawk prospect, as well as a maiden diamond drilling programme in the second quarter of 2018. The Black Eagle results are significant considering the project is still in its infancy. It gives the company some direction in identifying further drill targets, and determining the primary source of the gold mineralisation at the prospects which, by the way, is strategically located within ‘trucking distance’ of several world class gold mines. 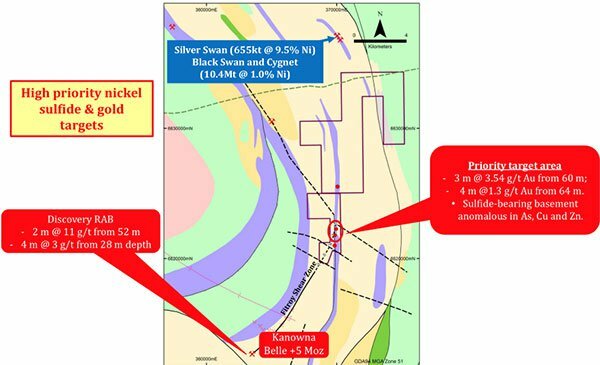 The Silver Swan South project is also, funnily enough, located just 10 kilometres south of Silver Swan high-grade underground mine (166Kt nickel). 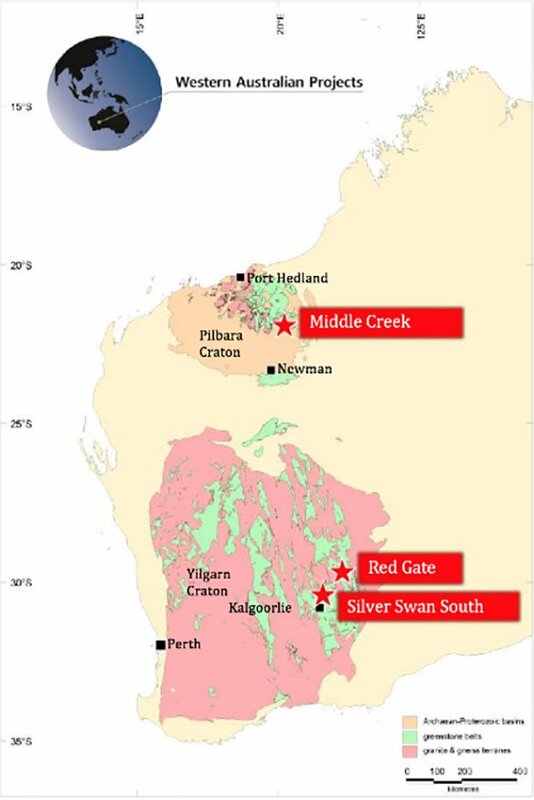 The company’s Red Gate Gold Project is located near Saracen’s Porphyry deposit (0.9Moz gold). It has returned high grade gold intersections (up to 9g/t gold) along strike of an untested 600-metre-long IP anomaly. It also contains several kilometres of untested shear and greenstone belt. Its other project, the Middle Creek Gold Project is located in the Pilbara, part of the Nullagine and Beatons Creek Conglomerate. The project contains visible gold in quartz veins, and have 1.3 kilometres of untested gold-in-soil anomaly. BSX is onto the right idea with its move to explore one of the highest grade cobalt regions in the world, in British Colombia. With Little Gem’s historic results average 3% cobalt and 20g/t gold (confirmed by BSX’s first hole intersecting 3% cobalt and 44g/t gold), it is aiming to unlock some seriously high-grade cobalt and gold. And BSX believes it can get the mine at Little Gem up and running with as little as a few million dollars. Having raised a very tidy A$5 million in funds last year to pursue Little Gem, it held A$2.18 million at December 31 and received a further $3.48 million following completion of tranche 2 in January 2018. Should it hit a road bump along the way at Little Gem, it also has top-quality exposure to gold and nickel exploration targets in the Eastern Goldfields and Pilbara regions of WA. Although the company does remain a speculative stock and investors should seek professional financial advice if considering this stock for their portfolio. Now is the time for BSX to execute on what it’s got, and unlock the considerable value it believes it has with its flagship cobalt project, and three gold projects in WA. 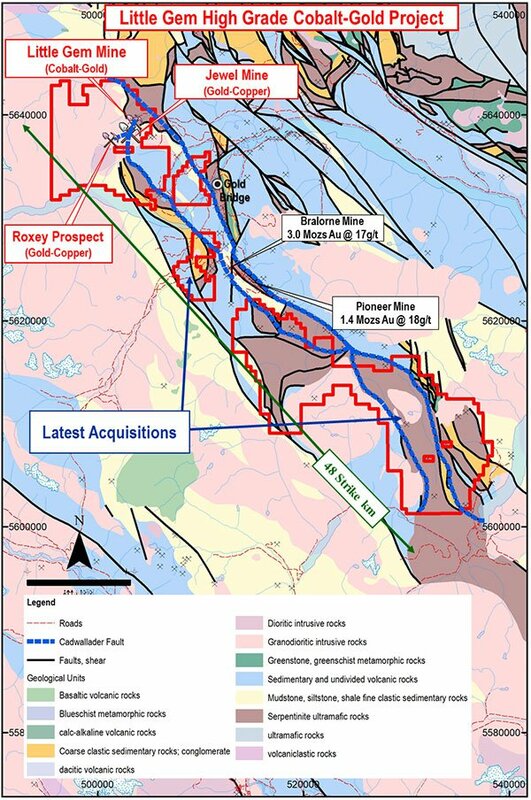 What’s coming up for the company is more drilling at Silver Swan South, targeting nickel sulfide and priority gold targets, and follow up for an interpreted strike extension of the Fitzroy Shear Zone which hosts the Kanowna Belle gold mine (+5.0Moz). It plans to drill the Red Gate Project and target high-grade gold (historical results included 12m at 9.2 g/t gold drill intersection and 79g/t gold rock chip sample. With its Middle Creek Project, it plans to continue with mapping and sampling and maiden exploration, all in preparation for drilling in the third quarter of this year. Of course, all eyes will be on the progress made at Little Gem. BSX will be engaging a drilling contractor to recommence the maiden drilling programme, to follow up the outstanding first hole intersection of 3% cobalt and 44g/t gold. No doubt BSX will be doing all it can to prove up new cobalt-gold and copper-gold prospects, and to get some attention-grabbing results in the public arena as soon as it can. 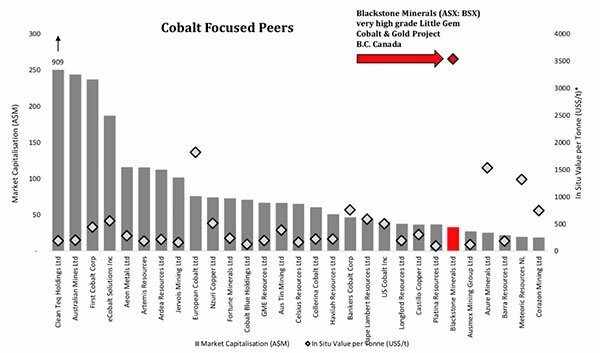 With all that going for it, plus a well-credentialed management team — boasting a formidable track record of Resource discoveries — we can’t help but watch on optimistically as this small cap looks to take the Cobalt Crown.